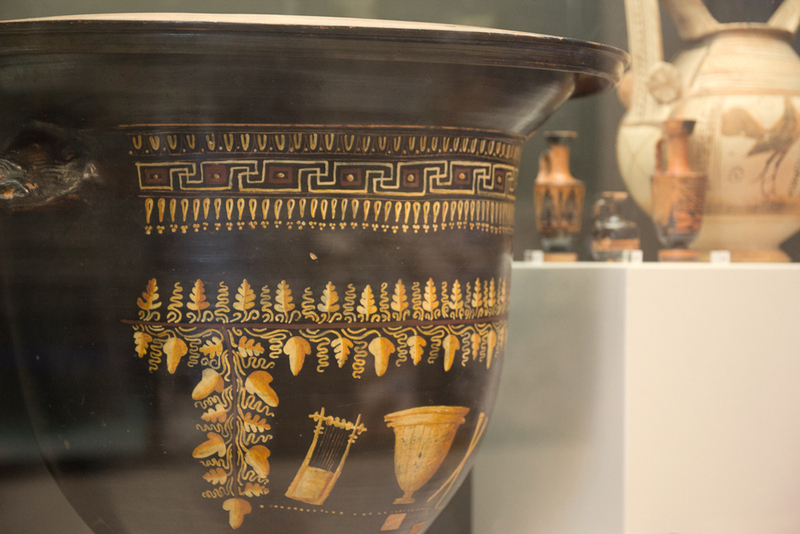 Wine has always been essential in the southeastern region of Italy: Puglia; the grape symbol was already present on ancient Greek vases (4th century BC) and wine implicit in Dionysus' cult representations. 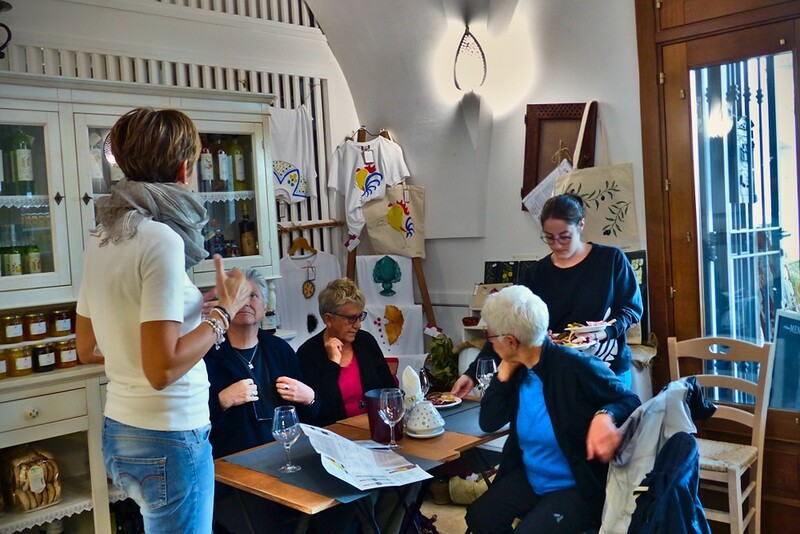 Through this cultural vacation you will experience Wine in art and history, approaching it also through tastings, delicious food and traditions. The beautiful hill and sea landscape together with the visits of the historic centres will be a pleasant immersion in the authentic life of this part of Italy, offering the well-known culinary arts as well as an ancient culture. from August 31 to November 2, 2019. Places: Egnazia, Polignano a Mare, Conversano, Ostuni, Brindisi, Grottaglie, Locorotondo, Alberobello, Monopoli and Bari – Puglia, Italy. First Day – Transfer from arrival place (airport or station of Bari) to Hotel Masseria Gravelle: itinerary introduction and a walk through the Masseria facility and farmed fields. 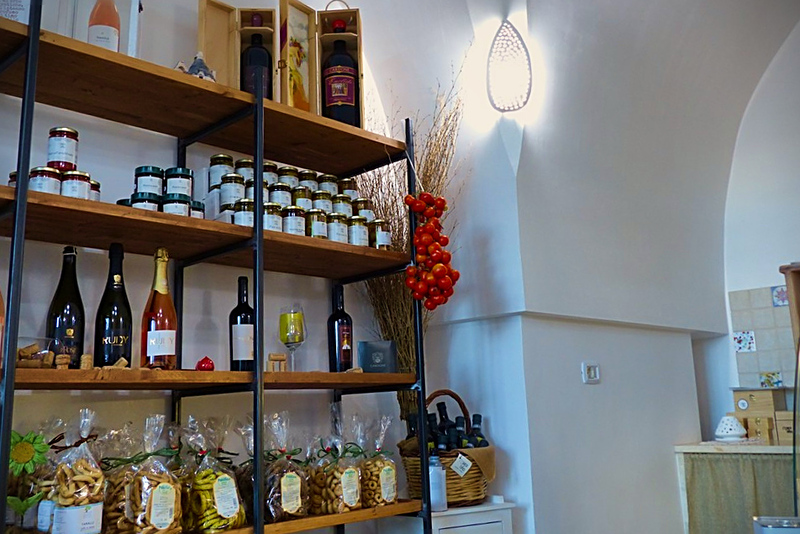 Here you will have a delicious dinner with their self produced cheese and meat specialities. Second Day – Guided visit of Museum and Archaeological Park of Egnazia: marvellous painted pottery and marble sculptures can explain the evolution of ancient arts and society through the centuries; the grape icon is often represented, since the wine was the symposium drink; outside, in the ruins of the archaeological area, you will recognize some typical elements of a Roman city: the Forum, the Thermal Baths and the Via Trajana. After Egnazia you will travel to Polignano a Mare for a walk through the old centre, perched atop a twenty meters high limestone cliff above crystal clear water; from here you will enjoy one of the most beautiful view in Italy; then you will descent to Lama Monachile for an impression about the erosion made by temporary water flows; this place is also known as the beach of Polignano: a pleasure to swim there... For dinner you will move to a close natural harbour to enjoy your seafood on a terrace restaurant, few meters from the sea, the tower and the abbey: La Colonna. Return to hotel. Third Day – This day starts visiting the Jaddico vineyard of Rubino Winery, near the shore line: here you will have a nice walk through the vineyard; afterwards you will move to the Rubino Cellar to experience production and storage of their different wine labels; then you will have a guided walk through the old city of Brindisi: the importance of this place began during the Roman Empire; here arrived the Appian Way from Rome and here departed ships towards Greece and Egypt; also in that time important good to export was wine. To conclude the day you will have a wine tasting and dinner at Numeroprimo. After the dinner, return to hotel. 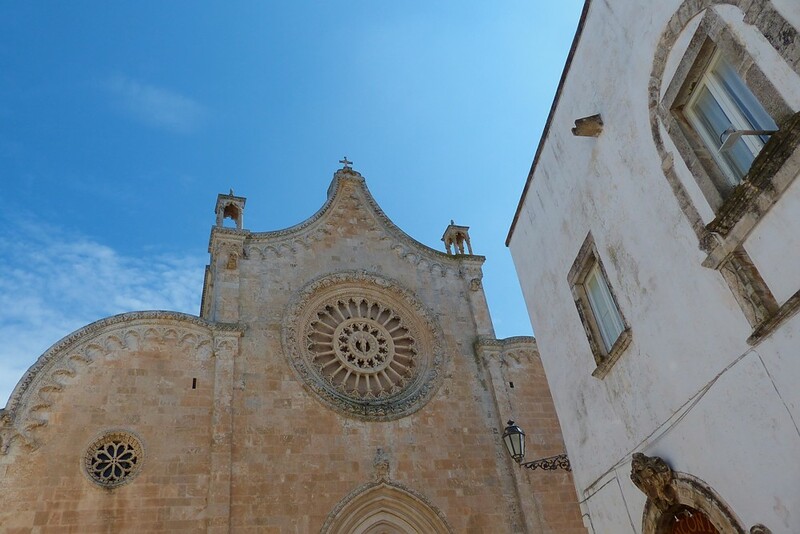 Fourth Day – Guided visit through the marvellous alleyways of Conversano, an old centre composed by white stones, stories and legends, where the coexistence of Lords, Abbesses and Bishops was never easy. See what remains of an important heritage: the Castle, the Monastery and the Cathedral; the guide will narrate facts and tales related to those places. From here you will reach the "White Town" of Ostuni: the small streets give an incredible panoramic view on olive trees, stone walls and the shore line; beneath the old town, you will end your day by a dinner based on local ham, cheese and salads. Return to hotel. Fifth Day – As seen in Egnazia, decorated pottery was produced already 2500 years ago for wine using, demonstrating the long ceramic tradition in Puglia; Grottaglie represents nowadays surely the most important centre for this craftsmanship; in the area close to the old part of the town are located workshops like the Fasano's one, who are continuing their family tradition; they will explain you their marvellous artwork. 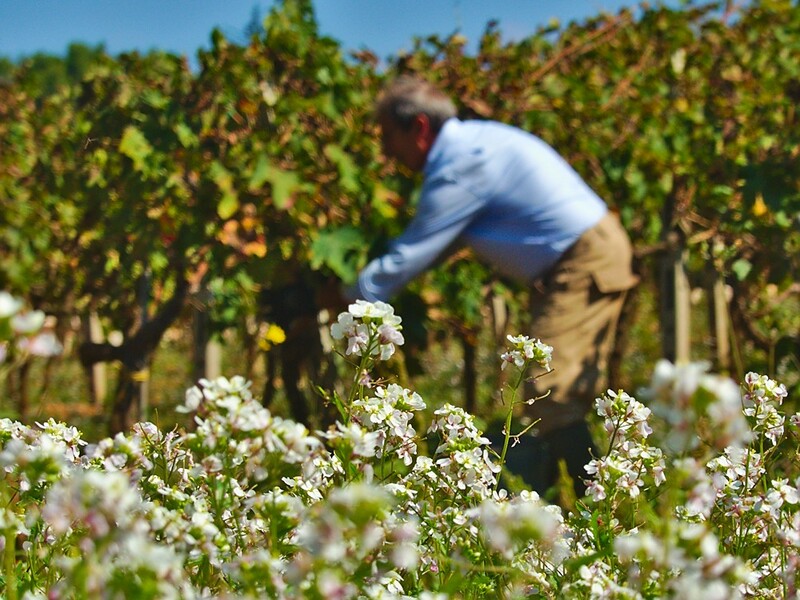 Afterwards you will travel to Locorotondo to meet Marianna at her family's cellar: your wine experience at Cardone Vini will continue by a pleasant wine tasting with local tasty snacks and the visit of a typical vineyard. In the evening you will have a walk in the picturesque old center of Locorotondo and a pizza before to return to your hotel. 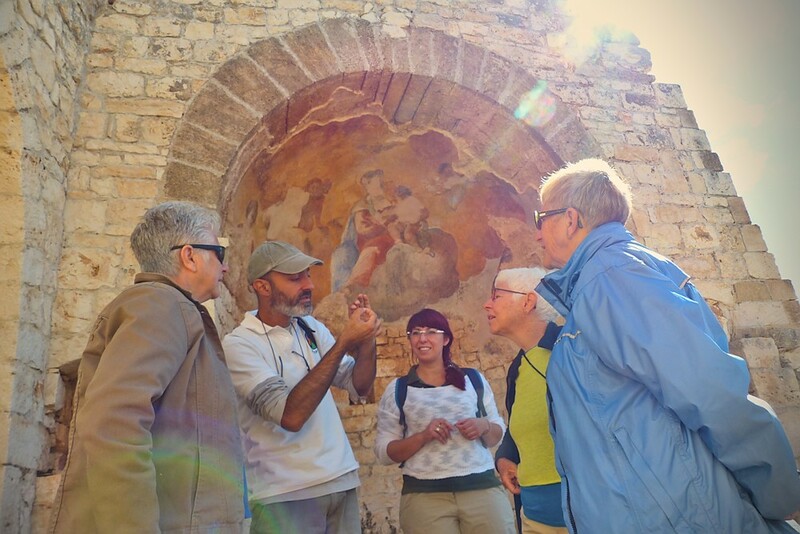 Sixth Day – Guided excursion by a researcher of Polyxena in the countryside for an enjoyable introduction of wild and farming plants of Puglia: you will meet the farmers, who will proudly show you their different plantations. Afterwards you will travel into the UNESCO site of Alberobello, to visit the iconic trulli, unique cone-roofed houses. You will enjoy your third wine tasting in a local winery with introduction of facility and their best wines. 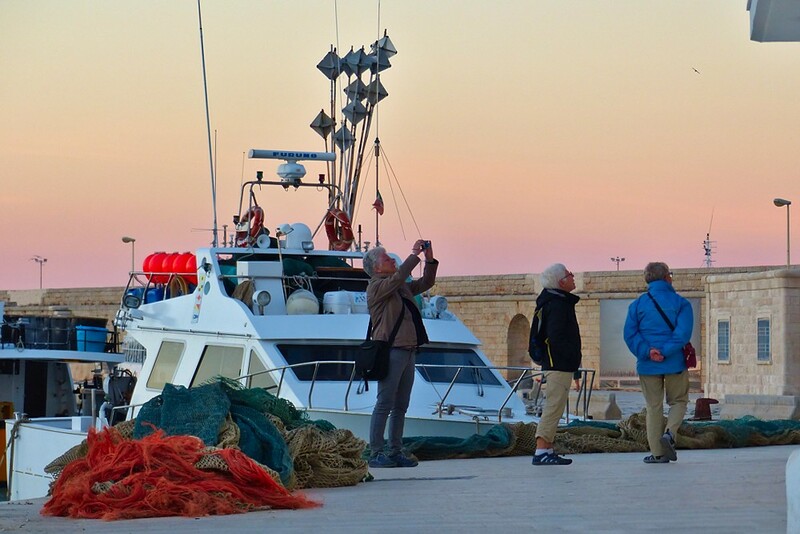 Your day will conclude in Monopoli, one of the most beautiful sea town in Italy: after a walk in the marvellous old centre, you will be delighted by a delicious seafood dinner at Guazzetto Restaurant. Return to the hotel. 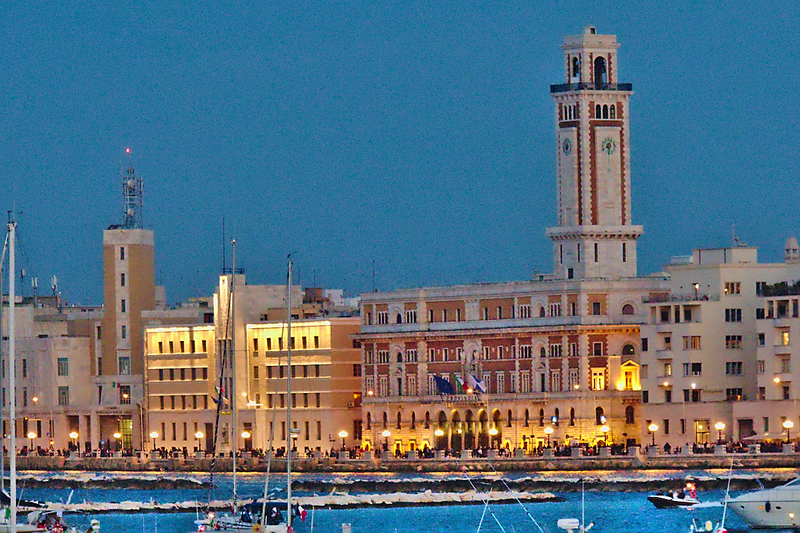 Seventh Day – This last day is dedicated to Bari: walking guided tour through the thousand-year old history of "Bari Vecchia": the Castle and two religious institutions, the Saint Nicholas Basilica and the Cathedral, will give you an idea of the complicated history of this place from Middle Ages to the present; walk through the Art Nouveau palaces and free afternoon for a relaxing walk along the seafront (Lungomare) or shopping time in the pedestrian and commercial area of Via Sparano. Return to Gravelle for a dinner with their genuine food and salutation. Eighth day – Transfer to the departure place. Places to start and terminate this travel: Airport or station of Bari. Hotel Masseria Gravelle is a country hotel, run by the Genco's family. The main construction, the restaurant, is the ancient barn of the 18th century with stone walls and arched ceilings. Masseria Gravelle is located in a prime location with a wonderful view of surrounding villages and sea in the distance. Double room with bathroom, fridge-bar, TV, wifi. At reservation and before down payment, we will confirm you the place availability. Discount for October 2019 arrivals: select your period! Down payment of 25% after confirmation. Final payment of 75% latest 30 days before arrival. The group will be made up of minimum two guests and maximum 8. We will communicate you the group size 20 days before arrival. English and German speaking tour leader throughout the duration (Luigi Piero Grieco or colleague); transfers to the indicated places as well as transfers from and to the airport or station of Bari; Schengen travel insurance: as indicated below. Included travel insurance: 8-day Schengen travel insurance for medical expenses (maximum 30000 Euro); repatriation: in the event of serious accident, serious illness or death. Meals: four dinners in selected restaurants with water and local wine; two dinners based on local ham, cheese and salads (with water and local wine); one dinner with pizza with water and local wine; breakfast every morning at hotel. In the price are not included the following services: travel from and to own domicile; other meals and drinks than the indicated; other guided visits than the indicated; other insurances than the indicated. Surcharge double room for single occupancy: 300€/week. Surcharge for one more overnight stay with dinner in the same accommodation facility: 130€/person. Surcharge for two more overnight stays with dinners in the same accommodation facility: 230€/person. by 9-seat minivan (Ford Transit Custom or similar) for larger groups. To this travel the General Sales Conditions of IDILLIO D'ARTE apply. For further information or program suggestion, please use the contact form or write to info@idarte.it or simply call the +39 / 080 403 81 28. IDILLIO D'ARTE informs that even if it is not needed a passport for border checks within the Schengen area (e.g. Italy, France and Germany are included in the Schengen area; United Kingdom and Ireland not), it is still always highly recommended to take a passport or ID card with you, so you can prove your identity, if needed (if stopped by police, boarding a plane, etc.). Schengen EU countries have the possibility of adopting national rules obliging you to hold or carry papers and documents, when you are present on their territory. Driving licenses, post, bank or tax cards are not accepted as valid travel documents or proof of identity. The non-EU citizens shall find information for visa to the Italian Embassy in their country: you can ask us for support. The guest shall verify any modification before departure as well as the health and security situation at destination by competent authorities (e.g. at www.viaggiaresicuri.it , www.gov.uk/travelaware or www.auswaertiges-amt.de). For further information regarding the Tour Operator IDILLIO D'ARTE, please consult the contact page.